The IDB and the BNT have once again teamed up to the train residents on Long island and San Salvador as bird guides. Led by The Bahamas National Trust and in partnership with the Ministry of Tourism (MOT), the training commenced in October with a total of 21 participants from both islands participating in theory training where they learn about bird identification, bird biology, bird migration, bird conservation, basic guiding skills and more. They have also been introduced to Ebird, an online database for bird observations, which helps people learn about bird distributions, bird sightings, species diversity and population fluctuations. This online data provides researchers with information on birds from around the world. Field training is ongoing on both islands as participants hone their skills in bird identification and guiding. Along with bird education, participants also received tourism training through the Ministry of Tourism’s Bahama Host program as well as logistical support through MOT’s Long island and San Salvador offices. . This year’s bird guide training is unique because it involves on the ground training on Long island as well as an innovative, distance learning modular training on San Salvador. The distance learning training involved conducting presentations using online webinar based software to simultaneously train participants on San Salvador and Long island. Both islands benefited from the presentations and could directly interact with the instructor during question and answer periods and activities. This mode of training could eventually be used for other family island training in the future which can maximize participant attendance and reach and minimize cost of travel expenses. Participants have also expressed their appreciation for the training. 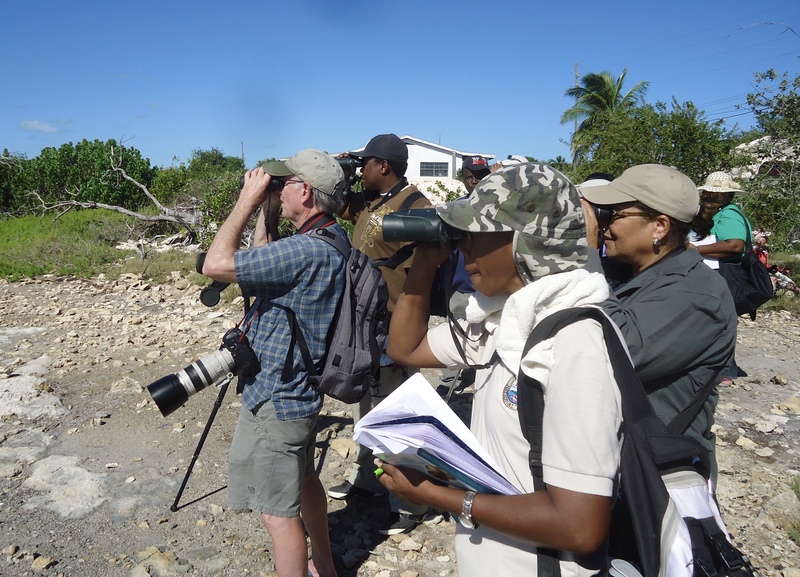 In 2014, the Bahamas National Trust, led a training program with partners from The National Audubon Society and Ministry of Tourism to train residents on Inagua and Andros about birds and promote bird tourism. The training resulted in 43 participants receiving certification in basic bird guiding, with nine participants becoming advanced bird guides in 2016. The Inter-American Development bank was a major sponsor for this work. Birds are the most well-known and charismatic of all animals in The Bahamas and Iconic species such as the Bahama Parrot and the Caribbean Flamingo are attractive lures for visitors interested in more than just sun, sand and sea. With over 340 species of birds have been recorded in The Bahamas, our islands are one of the most bird diverse countries in the West Indies. In 2014, bird related activities in The Bahamas brought in 39 million dollars into the Bahamian economy. People are definitely interested in Bahamian birds and seeing species that they never saw before. This opens up an eco-tourism niche for Bahamians to capitalize on. Tourism is one of the most important economic sectors in The Bahamas and accounts for 44.8% of our GDP according to the World Travel and Tourism Council. Visitors flock to our islands by the millions every, not just to bask in our warm sun and swim in our turquoise blue water, but to enjoy Bahamian culture and the environment. Eco-tourism brings in over 300 million dollars into the Bahamian economy, whether it be through bonefishing, swimming with pigs, sharks, and interacting with iguanas or even research tourism, our wildlife is an attractive feature of our islands. However, one aspect of eco-tourism that is quickly growing in popularity is birding and bird tourism. Photo 1 : West Indian Whistling Ducks on Long Island. One of the rarest ducks in the Americas, the West Indian Whistling-Duck is a large, graceful, mostly brown duck with black and white speckling on its flanks, long neck and legs, black bill and large feet. This duck would be a must see for any birder visiting Long Island. Photo 3: Long Island Birders looking for wetland birds in Clarence Town. Photo 2: Assistant Instructor , Predensa Moore provides assistance learning to use a field guide. Photo 4 : San Salvador Bird Guides visiting a wetland.